Old fashioned candy bars, made by Charlie Frank. Zingerman's Candy Manufactory got its start making great, old-fashioned American candy bars almost entirely by hand. Chunky, fat, fudgy bars you can wrap your hand around. They're not the serious kind of sweet you nibble with your eyes closed, hushed, your tasting notes near at hand. 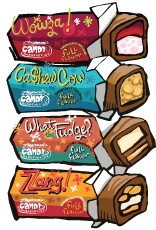 They're the kind where you chew great chunks off—fun, fantastic candy, made with all natural ingredients, without cutting a single corner. Charlie starts with honey nougat made with natural peanut butter. He rolls it up in silky caramel made from organic muscovado brown sugar. Big Virginia peanuts come next, and the whole endeavor is finished off with a dip into a rich bath of 64 percent dark Colombian chocolate. Cashew butter, roasted cashews, our own cashew brittle and a bit of puffed rice, milk chocolate and just a smidge of sea salt. Dipped in dark chocolate. An appropriate bar for anyone with a career in finance. If you turned a hunk of fudge into a candy bar, this is what you'd get. Layers of milk chocolate fudge, muscovado brown sugar caramel, and malted milk cream fondant make this the sweetest bar on our shelves. Great for kids of all ages. Raspberry ganache covered with raspberry nougat. Raspberry jelly candies come next, then a bath in dark chocolate. It's fresh and fruity. Smooth peanut butter and crisped rice mixed with bits of peanut brittle and covered in dark chocolate. A crunchy twist on a classic combination. "They remind me of the 1930s bars that were hand made, slab style." "Chewy, crunchy, sweet, salty and highly addictive—this luscious handmade candy bar puts the vending machine stuff to shame."